Myth Busting: Is Pumping Your Brakes The Safest Way To Handle A Skid? 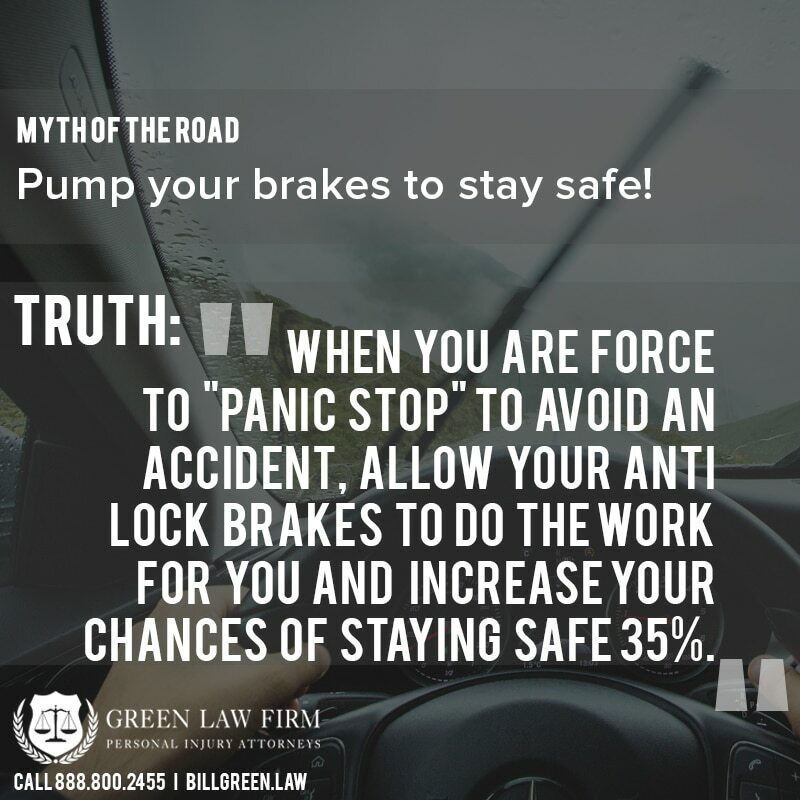 The Myth: Pumping the brakes saves lives! When it comes to opinions on staying safe behind the wheel, opinions are common; everyone has something to say about how you can be the safest… driver… EVER! But, when you’re faced with an accident and have split seconds to make a decision that could save lives, opinions mean nothing. What you want are facts! Will pumping your brakes in an emergency situation keep you safer? Many folks say “yes” it will. Let’s “brake” this down for you clear and simple. The Verdict: NO! Your default in any situation when you lose control of your car should NOT be to pump your brakes! Here’s what you need to know. The National Highway Traffic Safety Administration (NHTSA) required all new cars to be installed with an antilock brake system in conjunction with an Electronic Stability Control system as of September 2013. Your antilock brake system (ABS) is designed to help you keep control of your vehicle during panic-driven stops and adverse road conditions. Your ABS pules your brakes which, in essence, prevents your wheels from locking in places and allowing tires to retain traction and prevent a vehicle from entering into a skid. An ABS takes the place of your manually pumping your brakes – it senses a depression in your brake pedal and detects skid conditions. The result, is pulsing your brakes hundreds of times per second, which is endlessly faster than any human can do. This pulsing is said, in some studies, to decrease the risk of accident 35 percent. So, how should you use your brakes when you have ABS in place? In a non-emergency situation, apply your brakes the same way you would regardless if you had them or not; your vehicle should respond the same way. When you are making a “normal stop,” you shouldn’t even be pressing hard enough on the brake pedal to cause the ABS to kick into gear! In emergency situations, when it is key for you to stop in the shortest distance possible, just step on the brake as hard as you can ONCE and do it as quickly as you can. You should NOT pump the brakes! In fact, you won’t be able to. Step SOLID once, hold it down, and let the electronic system work for you. The NHTSA estimates that roughly 23 percent of vehicle accidents are caused by tailgating. Why? When you drive too close to the rear of vehicles in front of you, your chances of causing an accident increase exponentially; if you don’t have enough room, you can’t brake fast enough to avoid an accident! In rear-ending accidents, even your antilock brakes may not keep you from making contact with the vehicle in front of you; and if you don’t, you may still end up being run off the side of the road. Now let’s talk about the weather. Something so simple can wreck havoc on your ability to drive safely! 22 percent of vehicle crashes every year are directly related to weather and the accompanying driving conditions. Digging one step deeper, in accidents caused by weather, 73 percent of those are caused by wet pavement. Car accidents are bad news across the board. But, when you have been injured in one – whether you have experienced medical setbacks or lost wages for time missed at work – your first thought may be, “how can I get compensated for my accident?” You may contact an attorney to research how much money, if any, you can get to help you return to your regular quality of life. Being awarded damages in a personal injury case is hinged on the ability to prove that you are not liable for the negligence that caused your car accident. In the state of South Carolina, you may be up to 51 percent responsible for an accident and still be awarded some compensation for your injuries. Causing an accident because you failed to exercise caution in tailgating distance, or because you failed to take weather and road conditions into mind when judging your stopping distance, will affect your ability to place negligent blame on another party. If you, or your attorney, are unable to prove that you are not culpable for your accident, will strongly reduce your chances of receiving financial damages. Regardless if your vehicle is equipped with ABS or not, knowing how to properly handle the brakes in your call will keep you safer! Also, if an accident does occur, proper braking techniques will both reduce your chances of severe injury; it could also potentially work in your favor when proving that another driver is responsible for your accident!